With it’s green, spiny, exterior, jackfruit isn’t the most appetizing fruit to look at. But, ripe jackfruit pods are so tasty – to me! In fact, I don’t think there’s anything else out there quite like them. But then again, maybe I’m just being nostalgic. 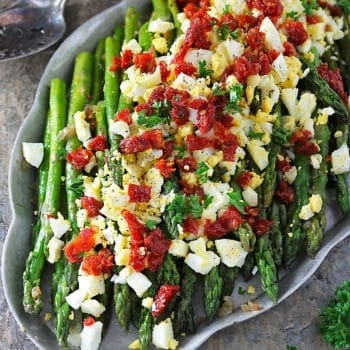 Do you have a tendency to miss those foods you grew up with and then were separated from, for whatever reason? Or, am I the only one with issues the tendency to glorify those fruits like jackfruit, rambutan, mango, papaya, passion fruit and mangosteen, which I grew up eating during my childhood in Sri Lanka and then was separated from for the longest time? These days, those fruits seem to be popping up in places like the Dekalb Farmers Market and several local grocery stores around Atlanta. Except for mangosteen which still seems to elude me – so if you happen to cross paths with this purple fruit, please do drop me a line. To me, ripe and sweet jackfruit (pods) tastes like a cross between a papaya, a mango, a banana, a pineapple and an apple. That’s a whole lot of deliciousness in one pod – right?! 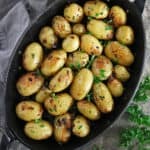 Now, young, unripe, green jackfruit that is sold in cans and in frozen packages is very different in taste – it is more bland, and as a result, it is a good vegan stand in for pulled pork, etc as it absorbs whatever spices it is surrounded by. But, ripe jackfruit is what I used in this Jackfruit Mango Smoothie, you see here. Now, jackfruit isn’t the easiest fruit to enjoy. It does involve a bit of work, but, it is so worth it! Step 1) Make sure you oil EVERYTHING! 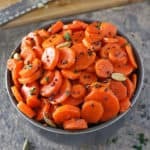 The sharp knife you will use, the cutting board, your hands – oil ’em all! Step 2) Grab two containers – one for the harvested jackfruit seeds and one for the jackfruit pods. Step 3) For easier handling, cut the jackfruit into half, and then cut each half into half again so you end up with 4 somewhat equal pieces. By the way, some stores sell jackfruit already cut into manageable parts. Step 4) Start digging! Yes, start separating and feeling through the fibrous (lighter yellow/white) parts of jackfruit to grab the firm, golden pods. Step 5) Make sure you oil and re-oil your hands as you work. I keep a small bowl with oil in it nearby so I can oil and re-oil as needed. Step 6) Once you have a jackfruit pod, cajole it open and pull out the seed with it’s “casing”. Step 7) Remove the seed from it’s “casing” and discard the casing. 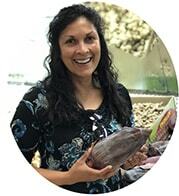 Save the seed in a container, and the golden jackfruit pod in another container. Step 8) Repeat steps 4-7 until all the golden jackfruit pods have been harvested. Usually, digging through a whole jackfruit takes my daughter and I about 30-40 minutes. Step 9) Discard the jackfruit skin and fibrous parts of it and store seeds and pods in airtight containers to enjoy. By the way, I made the quick (stop motion) video you will find below, to illustrate these points. 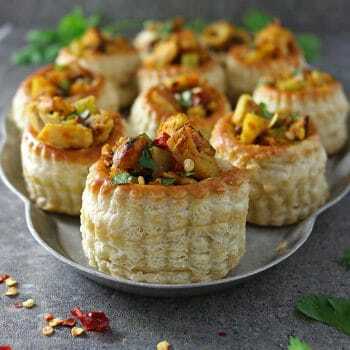 Jackfruit seeds can be baked in the oven or enjoyed in a curry like this Jackfruit Seed Curry. 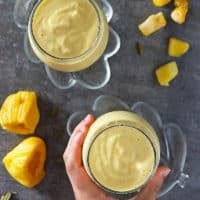 And, the ripe golden jackfruit pods can be eaten raw or made into a shake like this Protein Packed Jackfruit Shake (from last year) or the Jackfruit Mango Smoothie you see here today. I have also seen jackfruit flour made with dried and ground up jackfruit – but I have yet to try it out. 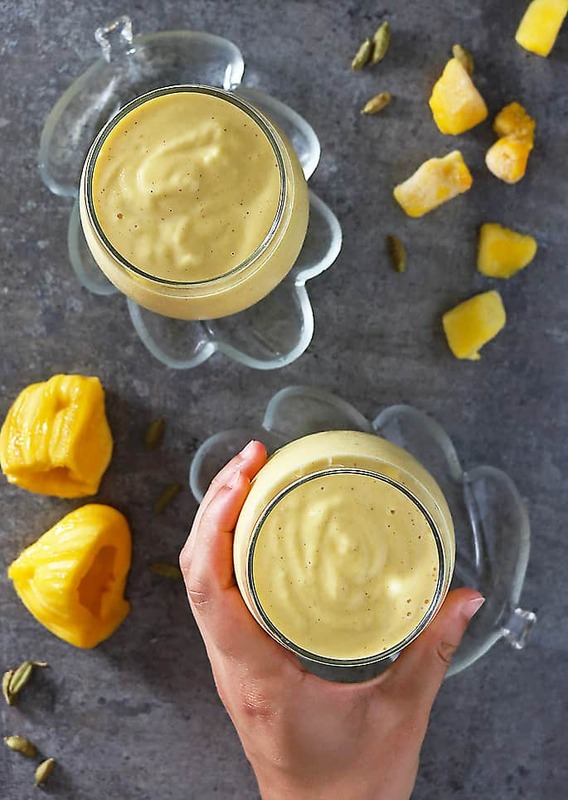 In this smoothie, I combined, ripe jackfruit pods, frozen mango pieces, dairy free milk, a pinch of cardamom, a dash of vanilla extract, some collagen and some protein powder. Now, the protein and collagen are totally optional and can easily be left out. This smoothie was so thick! You could enjoy it with a spoon or just go to town downing it and licking it off your upper lips! Either way, I hope you aren’t too intimidated to hack open a jackfruit and enjoy those golden jackfruit pods, the next time you seem one. 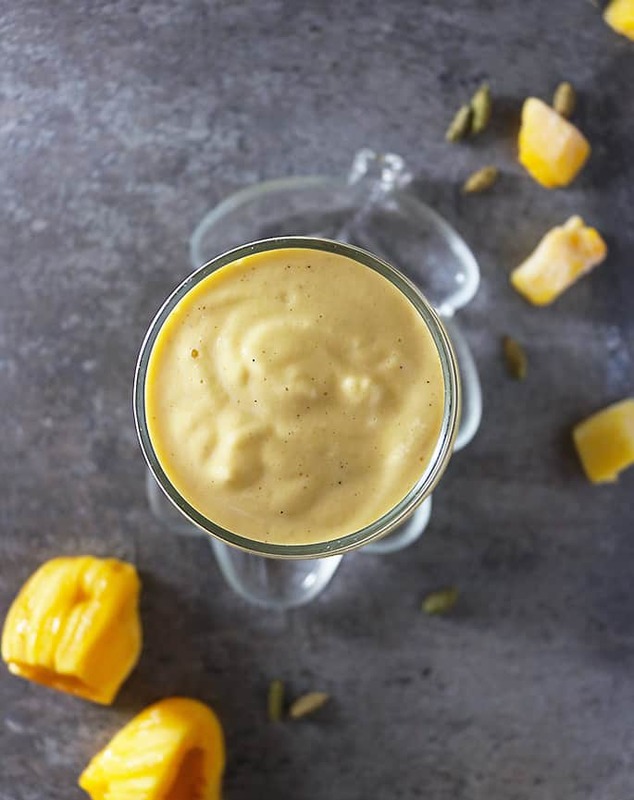 This gloriously thick and delicious Jackfruit Mango Smoothie is spiked with a hint of vanilla and cardamom – add in your daily dose of protein and collagen and this becomes more than just a refreshing treat to enjoy. 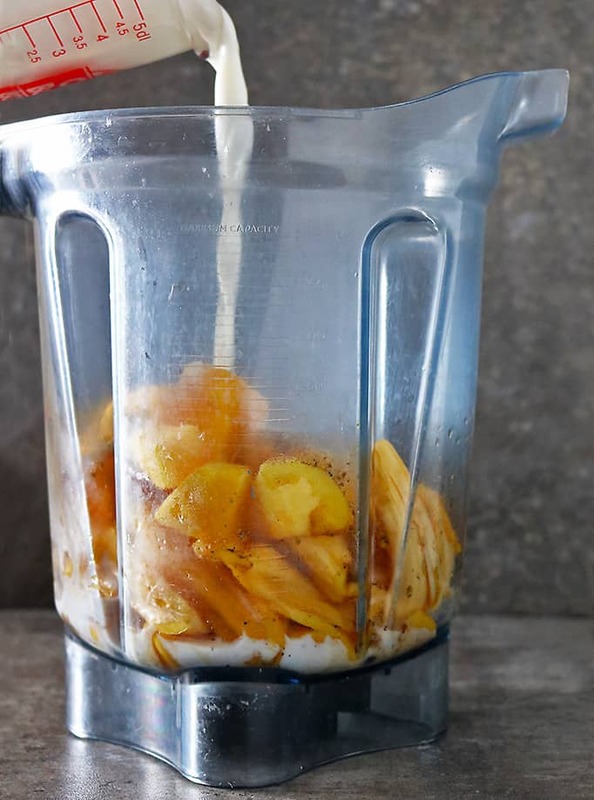 Add jackfruit pods, frozen mango, milk, cardamom, vanilla, collagen and protein to a blender. And blend until there are no more chunks of frozen mango clunking around. 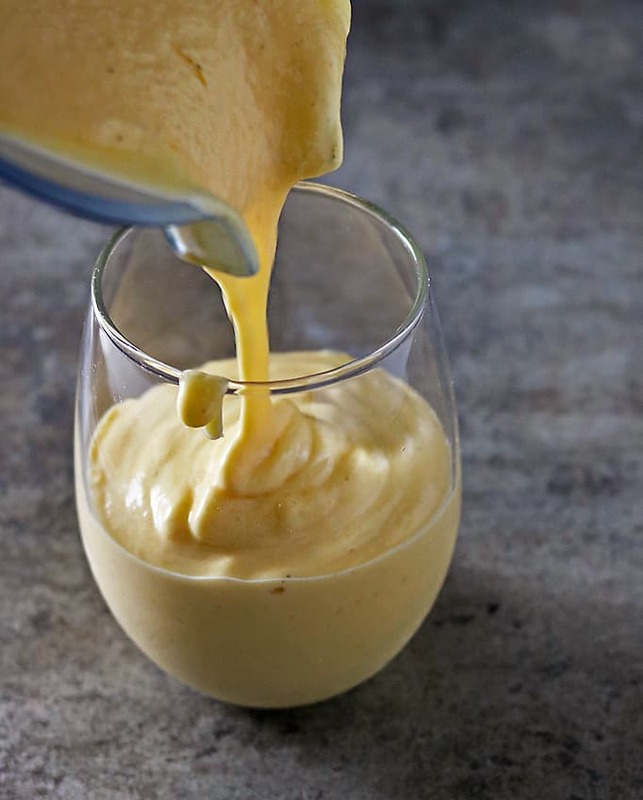 Pour the jackfruit mango smoothie into glasses and enjoy! Disclosure: Savory Spin is a participant in the Amazon Services LLC Associates Program, an affiliate advertising program designed to provide a means for sites to earn advertising fees by advertising and linking to amazon.com. Oh wow! This does look like quite the refreshing drink for summer! I love the addition of the vanilla and cardamom. I’d love to start my day with one of these smoothies! In addition I very much appreciate your detailed “jackfruit guide” which takes away a bit of the mystery jackfruits are surrounded – at least for me. The next time, when I see a jackfruit, Hiya, I’ll dare to grab it and test it with your yummy smoothie inspiration. Such a flavorful smoothie! mango and jackfruit are my favorite fruits! Love the tropical flavour! This is a smoothie I would love to try too. i would have never thought about jackfruit in my smoothie but….now im tempted to give it a try. i like ripe ones when cooked into savory dishes. 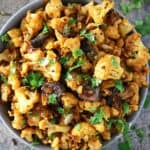 Confession: I have yet to try jackfruit. I know, I know!!! I MUST get on it and this smoothie looks like the PERFECT way to try it!! The flavors sound absolutely delicious, Shashi!! Plus, I’m swooning over the color! Pinning to try! 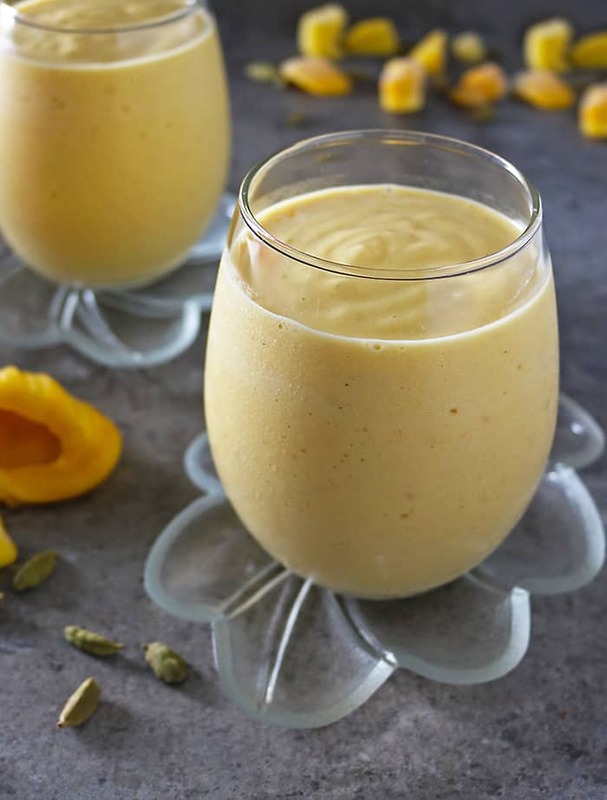 This Jackfruit Mango Smoothie really does look absolutely delicious Shashi. And with the addition of vanilla and cardamom too. Wow! Wish I could get jackfruit here to give it a try. I guess I’ll just have to fly on over to you to taste it at its source. 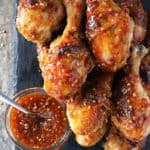 😉 Yum! Great video on how to cut Jackfruit too! I sometimes see jackfruit at our supermarket (maybe a dozen times a year), but haven’t purchased one. Don’t really know what to do with it. But now I do! This looks good — thanks. Well Jackfruit has yet to make it to our markets. But when it does, your Jackfruit Mango Smoothie will be the first thing I’ll make with it. As a matter of fact, I think I’ll make your recipe without the jackfruit. We call jackfruit “langka” in our dialect. Thanks for sharing!